The alacrity with which Mamata Banerjee used the issue of the CBI raiding the residence of the Police Commissioner of Kolkata to open a new front and sit on dharna against Narendra Modi and the NDA suggests that she was waiting for a trigger to start a movement against them before the 2019 elections. The CBI provided it with one by its unilateral action. With the success of the January 19 opposition rally having vanished in the succeeding days by statements from leaders of many opposition parties and Mamata not emerging as the natural leader of the opposition pack, she needed something that would propel her to the front. She seized on the CBI raid as the trigger to prove that the agency was being used by Modi-Shah and Ajit Doval to harass the opposition. But several things have emerged which show that although she might have played a grand political hand, legally she might be on shaky grounds. The CBI is investigating the chit funds’ case on the express orders of the Supreme Court. The involvement of the Centre is ruled out in this case. It had found some missing files in the evidence submitted in the case. Since Rajiv Kumar, the current CP of Kolkata, had headed the SIT that initially investigated the scam, it wanted to question him regarding this. It had been issuing repeated summons to Kumar but let alone appearing before the agency, the Kolkata top cop ignored the summons and did not even reply to them. It is not clear whether the CBI team went to arrest Kumar on Sunday or just went to search his premises and question him. Once there, they were subjected to lot of questioning about procedures, warrants and the rest. They were later detained at the Shakespeare Sarani police station and released after an hour or so. The CBI on its part deployed the CRFP to guard its offices in Kolkata and the Central agency cleared Kolkata police from there. Mamata gave a press conference where she said that the Modi-Shah combine and Ajit Doval were using the CBI to further their political ends and she would not allow that. She immediately announced that she would sit on dharna to ‘save the constitution’ and proceeded to do so at central Kolkata. The jury is still out on whether the CBI exceeded its brief. But the presence of Rajiv Kumar and other senior police officers beside the Bengal chief minister at the dharna site has made experts question the propriety of IPS officers openly aligning with political forces, for a political event. Questions are also being raised about the manner in which Mamata Banerjee obliquely asked the police, central forces and even the army to revolt against the Centre. Both sides have approached the courts – the CBI going to the Supreme Court and the Bengal government the Calcutta High Court. The next part of the drama will be played out in the courts. But what happened was unprecedented and extremely unfortunate. 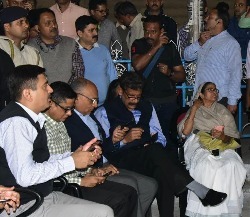 In the picture, one can see on the left of Mamata, Surojit Kar Purkayastha, the state security advisor and Rajiv Kumar, CP Kolkata second from left.